Are you enjoying the current heatwave in Ireland? We certainly are! Sunshine and good food go very well together. 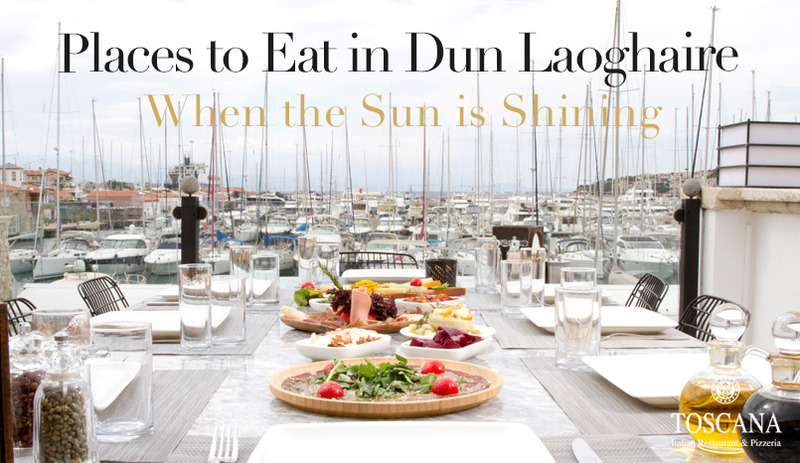 Nobody understands and appreciates this better than Italians, which is why we’ve put together this brief guide to places to eat in Dun Laoghaire while the sun is shining! An ice cream by the sea on a hot summer’s day is one of life’s little pleasures. If you live in or around Dun Laoghaire, then Teddy’s ice cream parlour will probably need no introduction. After nearly 70 years of serving delicious ice creams and sweets, it is an institution. Teddy’s is the place to go to if you want to cool down with an ice cream or satisfy your sweet tooth. It has been serving families for generations and has earned a household name that is synonymous with quality and satisfaction. Dun Laoghaire just wouldn’t be the same without this fine establishment. Another place to experience good food in the sun is the People’s Park Market in the People’s Park. This historic location is situated on the edge of Dun Laoghaire town centre and has been open to the public since 1890. It boasts some fine examples of Victorian architecture including the Gate Lodge and bandstand with its original gaslight standards. 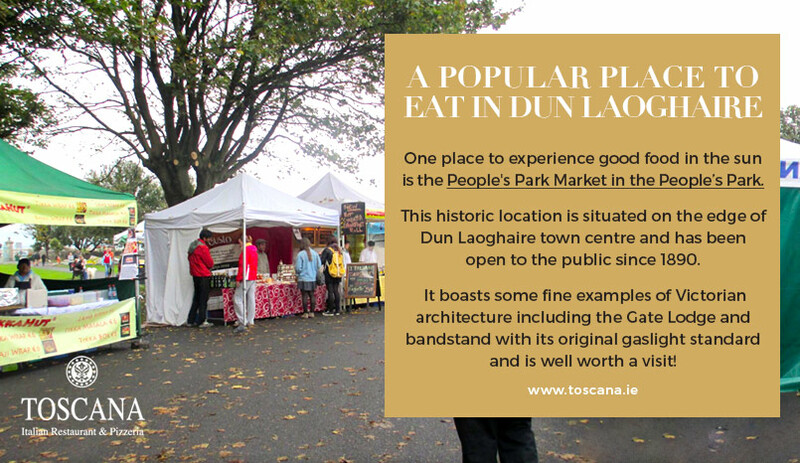 The Sunday Market is held every Sunday and is a popular place to eat in Dun Laoghaire. Made up of around fifty vendors, there is plenty of hot foods and baked goods on offer. There is nothing like the experience of a bustling market on a sunny day. The smells, sights and sounds all contribute to a unique, traditional, old world atmosphere. There is so much more to it than just buying food. But, having said that, the food on offer at the Sunday Market is usually excellent. Another place to eat in Dun Laoghaire in the fine weather is the FishShackCafé. Simply put, if you enjoy seafood you must visit the FishShackCafé. Located on the coast road in Sandycove, this restaurant offers many delights for the seafood lover as well as a stunning view overlooking Scotsman’s Bay. Even if you are not passionate about seafood, a visit to a seafood restaurant while you are in Dun Laoghaire is a must and the FishShackCafé is probably the best. And last, but certainly not least, if you feel like something Italian, Toscana’s offers a delightful al fresco dining experience. Enjoy the finest Italian dishes in Dublin while soaking up the sunshine and fresh air. 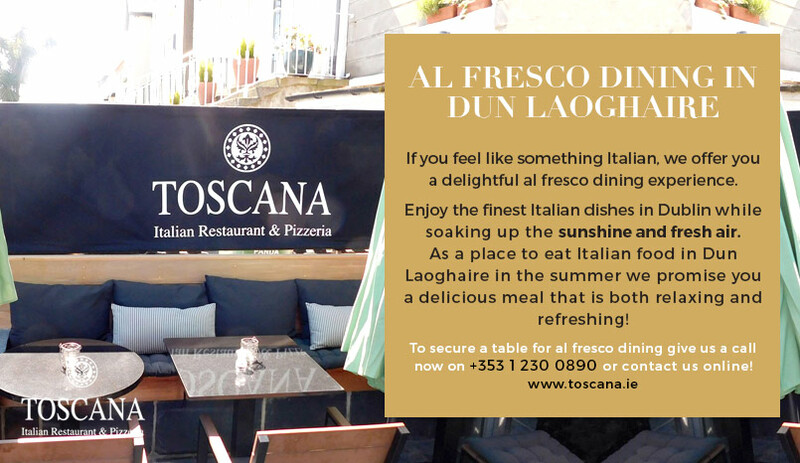 As a place to eat Italian food in Dun Laoghaire in the summer, Toscana’s really is unrivalled, promising a delicious meal that is both relaxing and refreshing. Yes, there is nothing like eating outdoors, especially in the sunshine and Italians know this better than anyone. We are proud and delighted to offer a little piece of Italy to this beautiful seaside town on the coast of Dublin and when the weather agrees there is nothing quite like dining at Toscana’s. If you’d like to dine in the sun with us then give us a call now on +353 1 2300 890 or reserve online!